"Seeking women ages 18–32 to participate in a study on ethics and morality. Generous compensation. Anonymity guaranteed. When Jessica Farris signs up for a psychology study conducted by the mysterious Dr. Shields, she thinks all she’ll have to do is answer a few questions, collect her money, and leave. But as the questions grow more and more intense and invasive and the sessions become outings where Jess is told what to wear and how to act, she begins to feel as though Dr. Shields may know what she’s thinking…and what she’s hiding. As Jess’s paranoia grows, it becomes clear that she can no longer trust what in her life is real, and what is one of Dr. Shields’ manipulative experiments. Caught in a web of deceit and jealousy, Jess quickly learns that some obsessions can be deadly." This was an amazing way to begin my year of reading in 2019! What a page turner this book was! I've been seeing such great reviews of this one on Instagram lately so decided to begin my year with this book. And what a book it was! 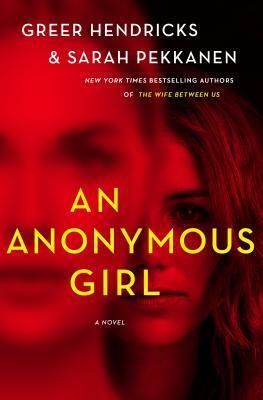 An Anonymous Girl begins with Jess signing up to participate in a study on morality where she just basically answers questions anonymously. Obviously the book goes on from there but really I don't want to tell you much more than that. It's going to be hard (when it feels like everyone is talking about this book) to miss spoilers but I really think that this is a book to just dive into without knowing much. I really don't think that you will be disappointed! It was such a compelling read and I found myself unable to set this one down. There was this layer of suspense and tension throughout the entire book. Reading it was like just waiting for the shoe to drop. You know things are going to turn bad - but you aren't sure how or when. Sorry for all of the metaphors but it was like this snowball building up and I was just waiting for it to hit and destroy everything. I almost found this one stressful to read at times (yes I'm a dork like that) but I still loved every minute of it! It definitely made me anxious as I really liked Jess's character so was worried about her throughout. The authors built the tension perfectly and I just couldn't stop reading as I had to see what was going to happen. I loved that they also kept me guessing throughout the book unsure of who I could trust. It was a wild ride that I just couldn't get enough of! Overall, I really enjoyed my time reading this book and am eager for more! I desperately need to go back and read The Wife Between Us by these authors that released last year. I'm kind of kicking myself that I let that one pass me by unread after enjoying this one so much but at least I have it to look forward to. The hype on this one is well deserved in my opinion! I'm so glad that I didn't wait to read this one as I sometimes am prone to do with books where it feels like everyone is talking about them. It was the perfect way to begin my year of reading in 2019 - if I enjoy all of the books I read as much as I enjoyed this one then this will be my best reading year yet! Bottom Line: A thrilling and compelling read that I couldn't stop reading! 4.5 stars! Disclosure: I received a copy of this book thanks to the publisher. These are my honest thoughts on it. I'm just about to start this one so I'm super excited to see that you enjoyed it. I have The Wife Between Us but haven't read it yet but had heard good things. I'm really excited to get started with this one! So far this year my reading has been on the cozy side so this will be a nice change.